Thanks, Anonymous! What's wonderful is the diversity of visual "voices" shown with just these three artists. One of the things I dislike about computer-based art (in addition to the failure to produce beautiful, complete originals), is that it tends to drive most artists in similar directions. Which version of Peg's Fairy Book do you own? Jill will have a magical Christmas! 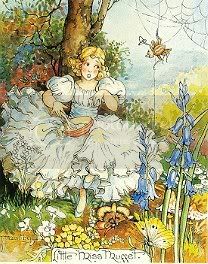 Thanks, Anonymous - the confusion with Cicely Mary Barker is understandable, given that she comes from a similar time period and painted similar things. I just had a look in J's room and there is a big CMB poster on the wall, featuring various Flower Fairies. The Peg Maltby picture I put up here isn't typical at all - I chose it because it was one we saw the original of at Dromkeen. In about 1988 I taught at Olinda PS and a visiting artist noticed 2 Peg Maltby drawings we had on display. He showed good interest and we had it confirmed that they were originals, one in very good condition and one a bit faded after years in a sunny room. One was of a koala and friends on a gum tree and the other a fairy scene. Peg had lived nearby and had a relation (grandchild?) at the school and was known to visit the school and draw on the chalkboard. Eventually we decided to permanently "lend" the pieces to Dromkeen. We had a visit one day and formally passed them over to be cared for and for all to see. Maybe you saw them! The school had professional copies made to remain hanging at school.I loved the koala one and also managed to have a coloured print made before they left for Dromkeen. Hope this is interesting and still finds you after the last comment in 2005. Thanks for your comment! It's wonderful to hear the history of the Olinda pictures and how they found their way to Dromkeen. I distinctly remember seeing the Peg Maltby that I've included here (the colours were very bright), but koalas also sound vaguely familiar. Good work on retaining copies at Olinda PS, and keeping the historical connection there as well!